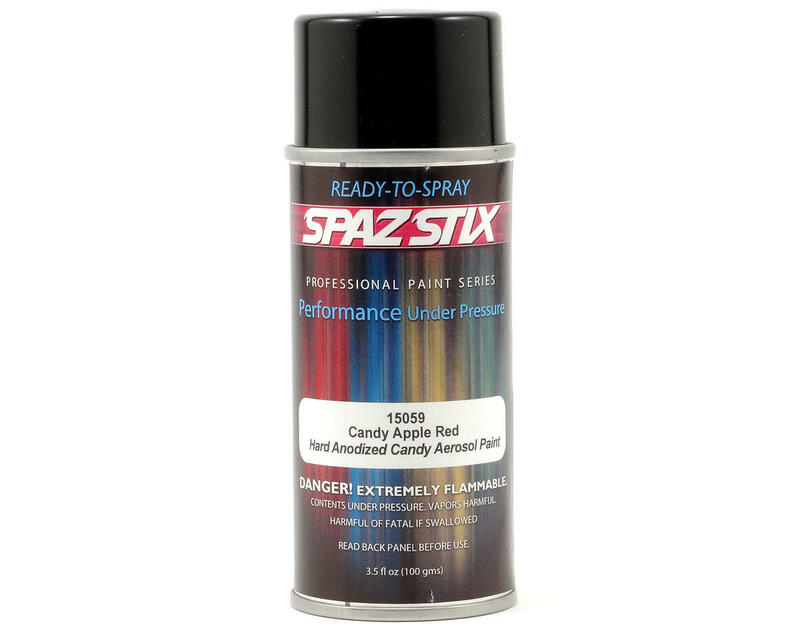 This is a 3.5 ounce can of Spaz Stix "Candy Apple Red" Spray Paint. Spaz Stix is the premier brand when it comes to high-end RC Paints... whether your a seasoned PRO or just breaking into the industry you'll find that nothing beats Spaz Stix when it comes to un-surpassed quality and ease of use! Yes, a few coats backed in black will look like a very dark red and not what you expect. This is a candy color, similar to translucent colors. These need several light coats and the proper backer. I painted my B4.1 with 4-5 light coats (light means spray over an area with one even layer...not spraying it 4-5 times until a thick layer is down and calling that 'one coat'). I had just under half the can left (by weight) when I was done. It would still let light through in a brightly lit area (hold it up to the sky and you could see the shadow of your hand through the painted body). Next step was to back it with silver. I had done a test on some lexan from the trimmed part. I sprayed it all with the red, then half with white and half with silver. The silver made the red pop more and gave it more of a metallic look. The white looked good, but was a lighter much less metallic looking color. I put on a couple coats of silver, enough to where I can't see my fingers shadow when holding it up to the sunlight. The result...a GREAT looking candy apple red. I've used Pactra metallic red, blue, white, and black. Spaz Stix colors look better. I'm sold. The best paint I've used and when used correctly looks great. When used wrong...well, just read the other review. This has got to be one of my favorite paints. Using any of the Spaz Stix candy paints and backing with their Mirror Chrome produces a really cool effect. It's especially good at providing the color for "marbleizing", providing a deep color that always gets people talking at the track. I highly recommend it. Nice color but let this paint dry for a day between coats. And watch out if you are using shoe goo to fix vents or screens because it will melt the paint and ruin your work even after drying for 2 days!